Are Rat and Mouse Bait Stations Used for Rodent Extermination Safe? When confronted with a rat or mouse problem, one option to consider is the use of bait stations. But the question is, are they safe? Four tiers have been created by the Environmental Protection Agency (EPA) for bait stations with varying protection levels. It’s up to the consumer which bait station(s) will work for their individual situation. Tier 1 bait stations are resistant to children, dogs, outdoor weather, and indoor conditions. Tier 2 is resistant to children, dogs, and indoor conditions. Tier 3 is resistant to children and indoor conditions. Tier 4 is only resistant to indoor conditions. Be resistant to resistant to weather. – Prohibit entry by children or dogs. – Can be sealed or locked. – Provides rodent entrances only. – Cannot be attractive to children in design or color. – Capable of visual precautionary statements. If you are experiencing a rodent problem and need help, hiring the professional services of a NYC rodent extermination company offers the best options for fast and efficient service. At Stern Environmental Group, we have NYC rodent extermination specialists with the experience necessary to handle the job of removal safely from start to finish. Call, email, or use the convenient contact form to set up an appointment. Rats are a year-round plague in New York and New Jersey metropolitan areas, but they become particularly bold and problematic during the summer months. New York City’s habit of piling trash at curbside for collection contributes to the city’s constant rat problem, enticing rodents to forage in trash bags, frequently in plain site of pedestrians. For many commercial enterprises, particularly restaurants, hotels and other members of the hospital industry, rodent control is a constant but necessary battle. Not only can a failed health inspection shut down your business, but it only takes a single rat scurrying across a floor to destroy a business reputation and send customers fleeing. Effective commercial rat control must address both lower and upper levels of a building. Contrary to popular belief, rats are not just sewer dwellers. Norway rats, which are the most common rodent species in urban areas, do frequently colonize sewers and subway tunnels, but they also build nests in buildings and will even nest in wood piles or in ground burrows. However, roof rats, which prefer to live in attics and the upper stories of buildings, are also a problem in New York and New Jersey urban areas. Effective commercial rodent control must address possible rat colonization in both the upper and lower floors of a building. Track & Trap rodent control systems identify rodent pathways, helping to prevent recurrence of rodent problems. Rat bites are not only painful; they can be dangerous as well. While some people think they are cute and cuddly, even domestic rats are not the most favored animals by most people. Rats are not known to be the most cleanly of animals on the planet. Rats are very intelligent critters. In the wild, they will travel the same path over and over to move from place to place. As they travel, they will urinate and defecate in any area that they are in so every place that they move within is contaminated by their urine and excrement. The teeth of a rat are very sharp. Rat teeth constantly grow and rats constantly grind them down so that they are able to consume food. These extremely sharp teeth mean that being bitten by a rat will likely result in a deep bite wound. To stop the flow of blood, apply direct pressure to the bite wound using a clean piece of cloth, gauze, or paper towel. This could take a while depending on how deep the bite wound is. After the cut has stopped bleeding, the wound must be disinfected by pouring a good amount of hydrogen peroxide or alcohol directly onto the bite wound. After disinfecting, apply Neosporin to the wound and wrap tightly with gauze or bandage. Be careful not to bandage the wound site too tightly as you will cut off circulation to the area. Anyone who has been bitten, or even scratched by a rat, should seek medical help. Deep rat bites may require stitches and in many cases rabies shots are given, especially when people are bitten by wild rats. Failure to obtain proper medical care can result in transmission of a wide variety of rat borne disease to the rat bite victim. Most people who are bitten or scratched by a pet rat do not become ill, but some do. When in doubt, seek medical attention for all rat bites. Residents in the state of Washington have recently been warned of the threat of Rat Bite Fever report Manhattan pest control experts. According to reports from The Wenatchee World on December 7, 2012, Rat Bite Fever has affected several people in Chelan, Douglas, and Grant County in Washington. Rat Bite Fever is an infectious disease that people pick up when they come in contact with infected rodents, their urine, or the secretions from their eyes, nose, or mouth. Rat Bite Fever is not normally a huge problem in the United States, but the bacteria (Streptobacillus moniliformis or Spirillum minus) should not be discounted when it arises. 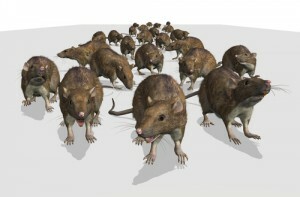 Most people who are subjected to Rat Bite Fever receive it via rat exposure, but other animals can be the cause as well. Squirrels, gerbils and weasels can also carry the bacteria in the mouths. Other animals can become infected with Rat Bite Fever and may or may not become ill from the bacteria. Watch for changes in pests such as cat, dogs, or mice. Any animal can spread Rat Bite Fever regardless if they show symptoms or not! People who are infected with Rat Bite Fever will experience fever, nausea, vomiting, muscle aches, and headaches. Because of the similarities, may people believe that they have the flu when in fact they have Rat Bite Fever. A rash on the hands and feet commonly occurs five days after exposure. Rat Bite Fever is not transmitted from person to person contact. It is transmitted via a bite from an infected animal, droppings, urine, or scratch. Any items that an infected animal has come in contact with should be carefully discarded so that Rat Bite Fever is not spread. Rat Bite Fever is also spread when water sources are contaminated.